Tough day at region after a good season. 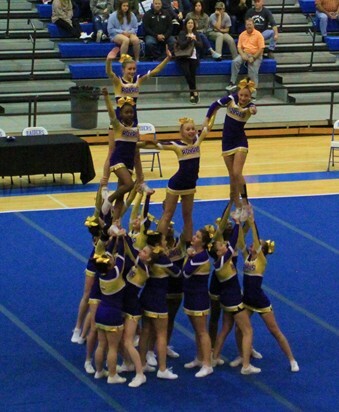 No one will argue that the BCHS competition cheerleaders have had a good season. Four first place finishes followed by a close second place finish last weekend in Swainsboro. But for the second straight year, a good regular season was spoiled by a bad day at region. Buoyed by a large crowd of family and friends, the squad came out with plenty of energy. 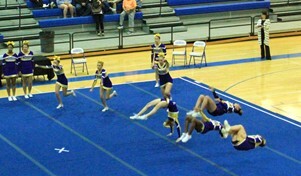 But a stunt group came down early. During the running tumbling section, someone�s knees hit. Though they would push through, BC never seemed to recover. Energy, execution, neither were at the levels seen during the year. It would be confirmed when results were announced. After winning 15 region titles (the last coming in 2014) BC didn�t place first or second for the third time in the past four seasons. They also finished behind Dodge County for the third straight year. The Royals will again seek to rebound at sectionals in Columbus November 9. It starts at 9 am.